At Storm Master Construction & Roofing, QUALITY MATTERS. Our professionals will oversee the entire roofing and construction project at your property, from inspection through insurance claims. We are experts at identifying damage sustained to your home or business after severe weather, and we have the skill, dedication and experience to complete your project to your exact specifications. We also offer our storm damage inspections at no cost to our customers. Insurance claims can be confusing, and that’s why it is important to have the right company assist you through the insurance claim process. Storm Master Construction & Roofing proudly offers this service to our clients free of charge. With several decades in the business, we are experts in roofing and construction. Our crews have been selected for their years of experience and for the quality of their craftsmanship. From the start of the project to completion, you will be served by experienced and caring professionals. Storm Master Construction & Roofing is a preferred contractor for the industry’s leading shingle manufacturers. Our certifications and experience allow us to offer you the best possible warranties in the industry. Composition shingles are made from a variety of composite materials manufactured to resemble everything from wood shake shingles to ceramic tile. They are available in a wide variety of styles, colors and calibers. Wood shakes and wood shingles are the most iconic roofing material in history. They add style and charm to any property. Get in touch to find out the variety of wood shingles we offer. Roofing slate is a dense, durable, naturally-occurring material that is essentially nonabsorbent. This type of roofing can add charm and curb appeal to your home; and, most importantly, this sturdy roof will protect your home for a lifetime. 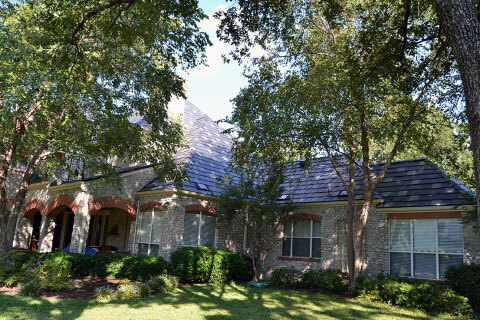 Metal roofing provides energy savings, beauty and protection for your home that can last a lifetime. Residential metal roofing systems are available in a wide variety of design options to complement any style of home. Offered in a multitude of colors, your metal roof can be a traditional vertical seam profile, or be manufactured to resemble wood shake, slate, shingles or clay tiles. We proudly offer a variety of siding options for your property to immediately transform the look of your exterior. Available styles and materials include vinyl, aluminum, steel, engineered wood and stone, and fiber cement. Along with roofing, we can also help you with your replacement window and door installation. We provide energy-efficient windows and doors to keep your home secure and cost-effective. Call us today to learn more about our services for windows and doors. Insulation is very important in keeping your property protected from the elements, as well as improving energy efficiency throughout your home. We specialize in adding fiberglass blown insulation in attics and other areas of your home. Storm Master Construction & Roofing would love to help you with your next project. For more information on what we can do for you, call us at (817) 589-7190 or fill out our contact form. We also have emergency services available 24/7. Storm Master Construction & Roofing is an industry leader in providing quality residential roofing products and services. Keep your home or office cozy and comfortable with the appropriate amount of insulation in your roofing and walls. We are proud to extend our services beyond just roofing and have a wide variety of exterior building services to offer. At Storm Master Construction & Roofing, we don’t just serve homeowners! We offer commercial services as well. With several decades in the business, we are the experts in roofing and construction. Our crews have been selected for their years of experience and for the quality of their craftsmanship. From the start of the project to completion, you will be served by experienced and caring professionals.